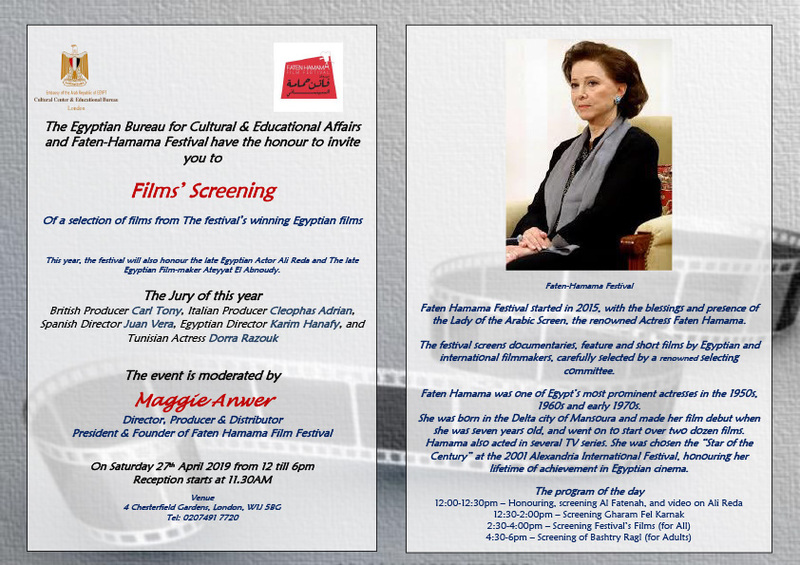 The event is moderated by Maggie Anwer – President & Founder of Faten Hamama Film Festival. The Egyptian Bureau for Cultural & Educational Affairs and Faten-Hamama Festival have the honour to invite you to Films’ Screening Of a selection of films from The festival’s winning Egyptian films This year, the festival will also honour the late Egyptian Actor Ali Reda and The late Egyptian Film-maker Ateyyat El Abnoudy. Spanish Director Juan Vera, Egyptian Director Karim Hanafy, and Tunisian Actress Dorra Razouk The event is moderated by Maggie Anwer Director, Producer & Distributor President & Founder of Faten Hamama Film Festival. Faten-Hamama Festival Faten Hamama Festival started in 2015, with the blessings and presence of the Lady of the Arabic Screen, the renowned Actress Faten Hamama. The festival screens documentaries, feature and short films by Egyptian and international filmmakers, carefully selected by a renowned selecting committee. Faten Hamama was one of Egypt’s most prominent actresses in the 1950s, 1960s and early 1970s. She was born in the Delta city of Mansoura and made her film debut when she was seven years old, and went on to start over two dozen films. Hamama also acted in several TV series. She was chosen the “Star of the Century” at the 2001 Alexandria International Festival, honouring her lifetime of achievement in Egyptian cinema. All films will include English subtitles.